Have you ever noticed a puddle of water around your hot water heater and realized that you have a leaky water heater drain valve? Do you have a leaking toilet causing a collection of water on your bathroom floor? Are you losing water pressure in your kitchen faucet? All of these conditions may be caused by leaking water pipes. 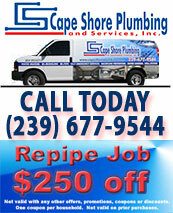 Pipe leaks can cause you hundreds of dollars every day they go undetected. The expert plumbing leak detectors at Cape Shore Plumbing use the most technologically advanced, state-of-the-art, non-invasive methods to locate those elusive, destructive leaks and stop the damages from flowing. Pipe deterioration is one of the most difficult plumbing problems to detect. After many years of continuous use, water pipes weaken and leak. Pipe leaks caused by weak pipes can cause leaking toilets, leaky water heater drain valves, clogged drains, and rusting or sediment accumulation in your hot water heater. Because clogged drains and toilets are a common problem in many households, improperly functioning or slow draining pipes will eventually begin leaking if not properly unclogged. 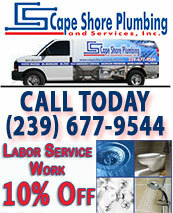 SWFL’s foremost plumbing leak detectors at Cape Shore Plumbing perform a thorough investigation of your plumbing pipes to find those clogs and leaks and repair them before further damage occurs. Many times pipe leaks are preventable. 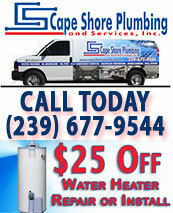 By calling the pipe leak detector experts at Cape Shore Plumbing at (239) 677-9544 today to perform routine checks of your plumbing system and perform preventative maintenance service, we can help you avoid the concealed, devastating water damages caused by leaking pipes. For 24/7 protection from leaking pipes, call the plumbing leak detection experts at Cape Shore Plumbing contractors today to schedule an appointment, and start the solution to your pipe leaking problem.